Stanley Fischer was born in Northern Rhodesia in 1943. 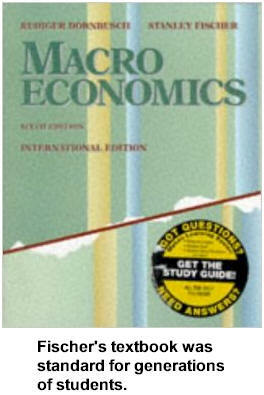 He studied at London School of Economics and received a PhD in economics from MIT. He taught and chaired the MIT economics department and co-authored a leading macroeconomics textbook with Rudiger Dornbusch. Fischer joined the World Bank in 1988 and became the first deputy managing director of the International Monetary Fund (IMF) in 1994. He oversaw emergency bailout lending and austerity programs over Mexico, Thailand, Indonesia, Russia, Brazil and Argentina. High flying Citigroup – under the helm of Sanford "Sandy" Weill – recruited Fischer in 2002. There he rose to become vice president with a seven-figure pay package. Fischer has not only been an ardent supporter of Israel, his professional efforts began when he took sabbatical leave to Israel in 1972 and 1976-1977. He was a visiting scholar at the Bank of Israel in 1980. More importantly for Israel, Stanley Fischer won an appointment to the Reagan administration’s U.S.-Israel Joint Economic Discussion Group that dealt with Israel’s 1984-1985 economic crisis. In October of 1984, Israeli Prime Minister Shimon Peres arrived in Washington asking an initially reluctant Reagan Administration for an additional $1.5 billion in U.S. emergency funding – over and above the already-promised aid $5.6 billion aid package.1 The help amounted to U.S. taxpayers funding each Israeli citizen $1,650. Another key component of the plan called for a largely unilateral lowering of U.S. tariffs and trade barriers to Israel, a program initially called "Duty Free Treatment for U.S. Imports from Israel" but later repackaged and sold as America’s first "free trade" agreement. 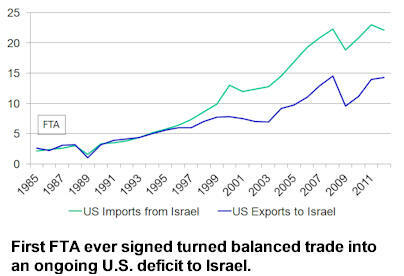 Over time the FTA reversed a previously balanced U.S.-Israel trading relationship for one that has produced a cumulative deficit to the U.S. that passed $100 billion in 2013. Seventy American industry groups opposed to the give-away in 1984 were disenfranchised when Israeli Economics Minister Dan Halpern and AIPAC illegally obtained a classified compendium of their industry, market and trade secrets to use against them in lobbying and public relations. An FBI espionage and theft of government property investigation was quashed before it could narrow in on those inside the U.S. government who delivered the secrets to Halpern. Like many of Fischer’s later IMF austerity programs, the Joint Discussion Group initially announced that strings attached to the aid would make it temporary. Secretary of State George Shultz insisted during a 1985 address to AIPAC that "Israel must pull itself out of its present economic trauma …. No one can do it for them … our help will be of little avail if Israel does not take the necessary steps to cut government spending, improve productivity, open up its economy and strengthen the mechanisms of economic policy. Israel and its government must make the hard decisions. "1 Shultz wanted to make the huge American cash transfer conditional on major Israeli economic reforms, but intense AIPAC lobbying in Congress threatened to make the State Department influence irrelevant. In the end, Congress delivered aid without Israeli sacrifices, such as selling off bloated state-owned industries and spending belt-tightening. The proposed privatization of $5 billion in state enterprises threatened too much bureaucratic "turf" and too many jobs, so Israel put them on hold. Fischer apologetically characterized the Likud years as a "wasted opportunity by a government that should have known better. "2 Not until 1996 were Fischer’s proscribed economic remedies adopted by American neoconservative consultants to Benjamin Netanyahu as minor points in the "Clean Break" manifesto for Israeli regional hegemony. They remain among the few unimplemented tasks in a plan that called for military action against Iraq, Syria, and Lebanon. Despite the absence of any real economic reforms that would take Israel off the American taxpayer dole, Fischer co-wrote a blustering 1986 article for the Wall Street Journal called "Israel Has Made Aid Work" that AIPAC circulated widely as an official memorandum of its achievements. 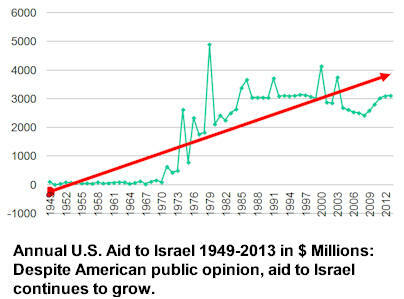 "Israel is the largest single recipient of economic aid from the U.S. This is partly because the economic stability of Israel is uncertain and is important to U.S. national interests. Therefore a report on the progress of the Israeli economy is relevant to policy decisions to be made here." Fischer never bothered to substantiate his premise, that U.S. national interests were somehow served by the bailout or that any aid given to Israel produced tangible benefits. Instead Fischer delivered a fusillade of dry and all but unreadable statistics about Israel’s temporary economic performance. Issues of long-term importance to most Americans, such as returning U.S. aid to the traditional format of loans to be repaid and the likely impact of the FTA on U.S. jobs went unaddressed by Fischer. Fischer’s core achievement – that the transformation of aid from loans to outright taxpayer give-aways – has been unchanged since 1986. The premises behind this ever-increasing entitlement and one-sided FTA performance are likewise never reexamined by Congress – despite the fact that a majority of polled Americans have come to oppose aid increases to Israel. Fischer’s rare admonitions that Israel be held to account, unlike like the economies he transformed through biting IMF austerity programs, have remained nothing more than lip service. At the end of 2004 Israel’s U.N. ambassador recruited Fischer to become the head of Israel’s central bank, asking, "Why not be our governor? "3 Fischer accepted and initially provided endless amusement to reporters by insisting on speaking Hebrew during press conferences and refusing to speak English. Initial concerns that Fischer’s global stature and experience would overshadow and chafe the relevant players in Israel proved unfounded as Fischer moved energetically into his new role. AIPAC continued to trumpet Fischer’s accomplishments steering Israel through the global financial crisis, though beneath the surface he was performing far more serious tasks for Israel and its global lobby. It came as a surprise to many when the Wall Street Journal and Israel’s Channel 2 news simultaneously reported in early December 2013 that the White House was "close to nominating" Fischer to be appointee Janet Yellen’s second-in-command at the U.S. central bank.9 Media reports initially indicated that Fischer’s candidacy-to-Senate-confirmation would proceed on greased skids – with no Senate debate – taking only a week so that the pair could quickly take over the Fed in January. However, the Senate concluded its 2013 business without taking up the matter. The earliest date the measure could be put up for a vote is January 6, 2014. Even that date might slip since Senator Rand Paul and Minority Leader Mitch McConnell plan to delay the vote unless a long-languishing measure to "Audit the Fed" is also put up for a vote. An equally important target for Fischer and Israel may be – somewhat ironically given their pro-boycott programs – anti-boycott activities. In the 1970-80s the Federal Reserve played an active "moral suasion" role chastising and corralling U.S. banks away from any activity that Israel construed as compliant with the Arab League economic boycott. An expert with deep experience enforcing the international boycott of Iran, Fischer is likely aware of the many active American grass-roots campaigns aimed at ending the Israeli occupation of Palestinians through targeted boycotts. These boycotts range from efforts to get retailers to stop carrying manufactured goods produced in the occupied West Bank (Ahava and Soda Stream), to overturning contracts with firms providing services in occupied territories (Veolia), to academic boycotts and even efforts to get labor union pensions to divest from Israel bonds. Working more closely with Israel and AIPAC, the Fed could become a vital node for reinterpreting and enforcing old or new laws aimed at outlawing and punishing groups organizing such grass-roots activities by targeting U.S. bank accounts and freezing their financial flows. Fischer may also want to launch "exercises" to prepare the U.S. financial system for the fallout of Israeli military attacks on Iran. New bills in Congress drafted by AIPAC call not only for additional sanctions aimed at thwarting a fledgling deal on Iran’s nuclear program (favored 2-to-1 by Americans). AIPAC’s bill forces the U.S. to "have Israel’s back" in the event of a unilateral Israeli strike. If Israel has already decided to attack Iran, it would benefit immensely from having Fischer inside the Fed, protecting the financial flows Israel now regards as all but a birthright from its primary global underwriter. Less well-known is the Fed’s authority to authorize foreign bank acquisitions. Any future Israeli campaign to further entwine its banks into the U.S. financial system through acquisitions would likely find a much more welcoming regulator in Fischer. Whatever the real motivation for Fischer’s sudden, inexplicably rushed insertion into the Federal Reserve, it is also worthwhile to note longstanding Fed policies have correctly considered U.S. citizenship to be preferable for at least one key position, "because of the special nature of the supervisory function, the need to ensure confidentiality of information, and the delegated nature of the function." Unfortunately, that policy preference covers only Fed bank examiners rather than top leadership – the Federal Reserve Act is silent on the wisdom of installing a revolving door for returning U.S. citizens who took on dual citizenship as a condition of serving a foreign government. 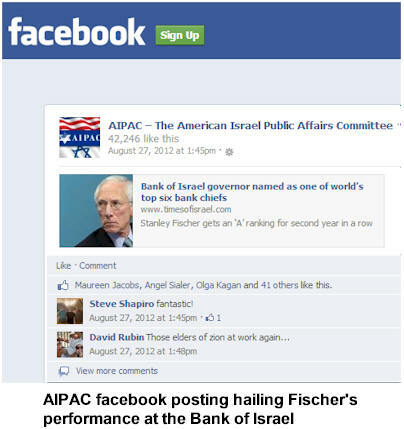 AIPAC, Fischer’s co-author of harmful U.S. economic policies on behalf of Israel, likely sees the Fischer appointment as an important test case to assess American tolerance for openly dual Israeli-American citizens running key U.S. federal agencies. In 2009 former AIPAC research director Martin Indyk, who was at the center of AIPAC’s research division during the FTA push, said that "the US-Israel Free Trade Agreement served as a wedge that opened up the Congress to free trade agreements across the world, including the NAFTA agreement." Likewise, if Fischer can be "wedged" into the Fed, it begs the question of why former Israeli ambassador to the U.S. and historian Michael Oren could not someday lead the Near East division of the State Department. From AIPAC’s perspective, having qualified Israelis directly run key divisions of the U.S. Treasury such as Terrorism and Financial Intelligence, rather than indirectly through AIPAC-vetted appointees such as Stuart Levey and his hand-picked successor David Cohen, could probably boost the volume of taxpayer give-aways while improving coordination with Israel. Given AIPAC and Israel’s overly large influence on U.S. military initiatives in the region, the lobby may now feel the moment is right for appointing Israeli generals into the Joint Chiefs at the Department of Defense. This, AIPAC may well reason, would be much more convenient than constantly arranging visiting Israeli military and intelligence delegations that increasingly serve as sole briefers (rather than DoD or the American intelligence community) of members of the US Congress. 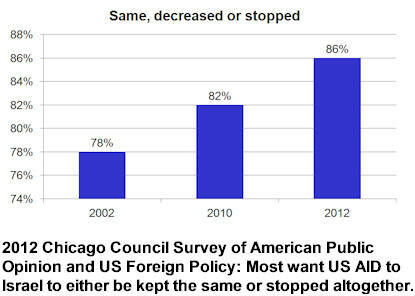 If Americans were ever polled on it – and they never are – the majority who now object to increasing aid to Israel would also likely object to quasi-governmental and governmental positions being staffed by people who – by citizenship or sheer strength of identity politics – are primarily occupied with advancing Israeli interests rather than those of the United States. 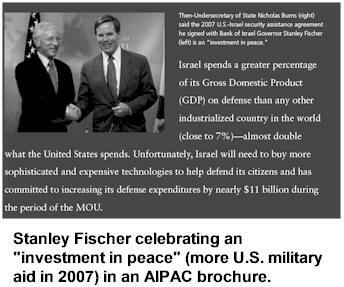 It is obvious that the real reason AIPAC and its economic luminaries such as Fischer never substantiate any of the advertised benefits the U.S.-Israel "special relationship" delivers to America in return for all of the costs is simple – there simply aren’t any. As greater numbers of Americans become aware that the entire "special relationship" framework is sustained by nothing more than Israel lobby campaign-finance and propaganda networks, the harder the lobby will have to work to forcibly wedge operatives like Fischer into positions where they can thwart growing public opposition – whether it takes the form of boycotts or grassroots opposition to the U.S. fighting more wars for Israel. In the very short term, Americans can only fight such undue Israel lobby influence by again – like during the drive to attack Syria – staging a mass action to demand their senators reject Stanley Fischer’s nomination. Grant F. Smith is the author of America's Defense Line: The Justice Department's Battle to Register the Israel Lobby as Agents of a Foreign Government. He currently serves as director of research at the Institute for Research: Middle Eastern Policy in Washington (IRmep), D.C. Read other articles by Grant, or visit Grant's website. This article was posted on Thursday, December 26th, 2013 at 8:00am and is filed under Currency, Economy/Economics, Iran, Israel/Palestine, Money supply, The Lobby, Wall Street, Zionism.